Today there is a new challenge up on the Peachy Keen Stamps challenge blog that is Anything Goes. You can join us by creating any kind of project you want using Peachy Keen Stamps. How fun is this egg stamp and faces in the March Stamp of the Month?? 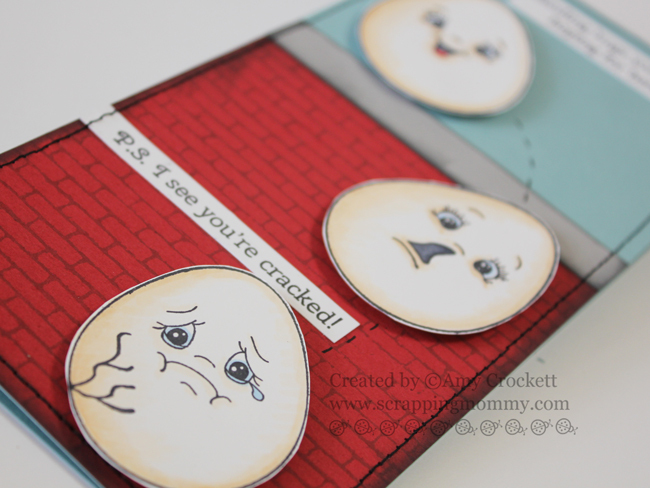 I really had fun making this "Humpty Dumpty" themed card. This is a tall card and measures 4 x 9 inches (perfect for a legal sized envelope). I cut and colored the eggs with a little bit of Copic marker. I also stamped the Brick Wall Background and added a little shading with an ink pad. I also added sentiments from the Wisecrack Sentiments and then stitched around the edge of my card with my sewing machine. I hope you can hop on over and join us at the Peachy Keen Stamps challenge blog and join us......I can't wait to see what you create!! I will also have another fun Peachy card up on my blog later.....don't forget to come back and check it out. This is such a fun card! I love how the eggs are falling and the brick background. The stitched edge looks fabulous too! Such a cute card!! TFS! This cracks me up:) So fun! Great job! Oh Amy!! How did I miss THIS amazing card!!!! It's a little gem. The changing expressions and the falling eggs...wonderful stuff! How cool! Love the way you used the sentiments:) Thanks for the inspiration.